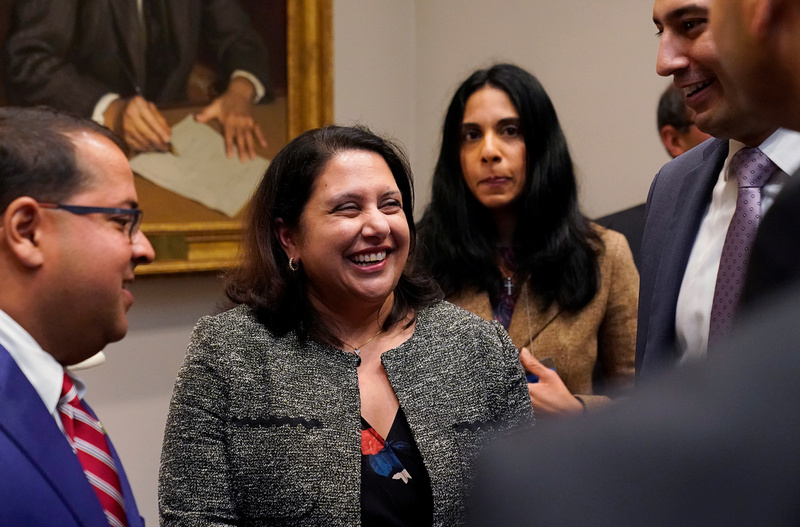 President Donald Trump will nominate Neomi Rao, administrator of the Office of Information and Regulatory Affairs (OIRA), for a seat on the U.S. Court of Appeals for the D.C. Circuit. Speaking at the White House’s Diwali celebration Tuesday, the president said he was slated to make the announcement on Wednesday, but was so delighted by the event he spontaneously decided to reveal Rao’s pending nomination. Diwali is a Hindu religious festival and Rao is Indian-American. The D.C. Circuit seat in question was vacated following Justice Brett Kavanaugh’s confirmation to the U.S. Supreme Court. Rao, the daughter of Indian immigrants, has served as the Trump administration’s deregulatory czar since 2017, and is widely considered a leading authority on agency law. Before re-entering the White House, she founded and led the Center for the Study of the Administrative State at George Mason University’s Antonin Scalia Law School, increasingly a bastion of conservative jurisprudence. Rao has led the Trump administration to meaningful successes in its vaunted regulatory rollback. She crowed about the administration’s achievements in a Washington Post op-ed on Oct. 21. Conservative legal commentators praised Trump’s pick, as they did when Rao was first named OIRA administrator.